The emergency services know only too well how lives can change – or end – in a split second. Each day they must be prepared for that car crash, house fire or rail disaster which could have a devastating effect on so many people. It is a scenario tragically all too familiar for the firefighters and paramedics who are called into action with little more than a moment’s notice. 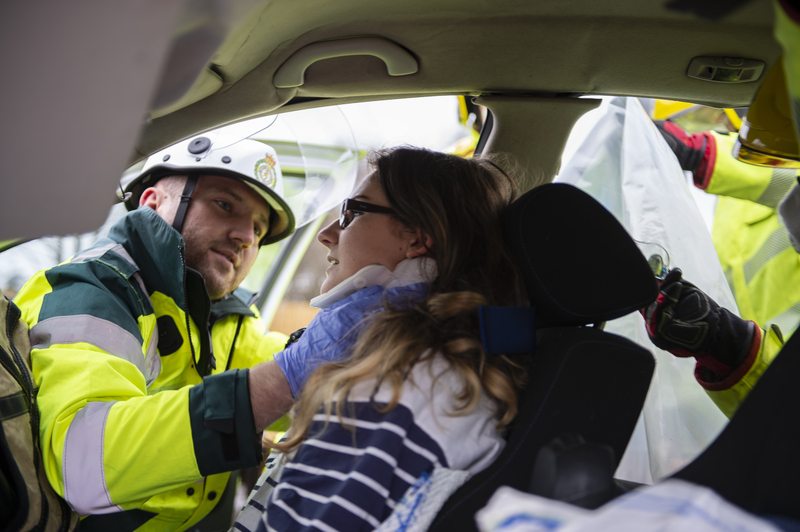 Every second counts in a life-or death situation which is why emergency exercises are vital to test and train those at the sharp end, while acting as a safety warning to the public. 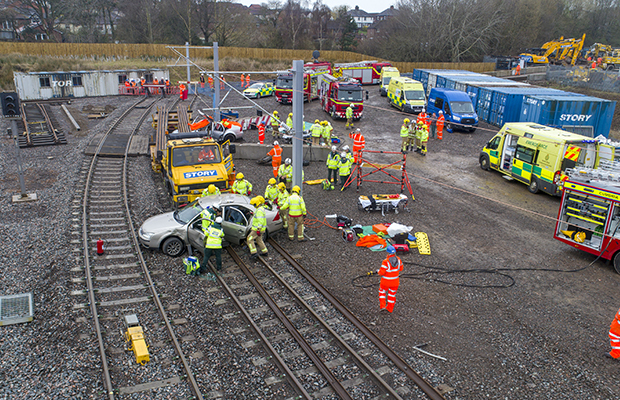 So, a multi-agency operation designed to test responses to a serious incident was held at Story Contracting’s new test rail track on the Burgh Road Industrial Estate in Carlisle. It also served as a hard-hitting message to drivers to take care on the road particularly near level crossings. Fire and ambulance staff were briefed to attend a road crash at a railway level crossing; multiple casualties were expected. They arrived to find the wreckage of two cars on the track. In a race to see who could get away from work the fastest, the drivers had ploughed into a rail vehicle on the crossing. Five young people – who minutes earlier had been discussing plans for the weekend – were trapped in the cars with serious injuries; a rail worker was already dead having been hit by one of the cars; the driver of the rail vehicle was still in his cab with serious leg injuries. For the 50 staff who turned out from Cumbria Fire and Rescue Service, North West Ambulance Service, Network Rail and Story Contracting, time was of the essence. Overhead power lines had to be isolated before the injured could be cut from their vehicles with hydraulic lifting and cutting gear and ferried to waiting ambulances. It was an evolving scene with the condition of casualties changing by the minute as the crews worked in extreme conditions. On this occasion it was make-believe – but all too often these scenes are real and for this reason the emergency teams reacted as if it was. Organised by Story Contracting in conjunction with the Cumbria Fire and Rescue Service, Network Rail and the North West Ambulance Service, the exercise is the first of its type in the Carlisle area. The whole operation was masterminded by an Incident Command Unit with Tony Paterson, Watch Manager with Cumbria Fire and Rescue Service, operating as Exercise Director. Tony said such multi-agency exercises were invaluable in allowing the emergency services to practise and plan for such scenarios. “We are extremely fortunate to have such a fantastic test track facility here at Story Contracting which allows us to work with the other agencies to test operational responses,” he said. For Tom Wall, Technical Training Manager with Story Contracting, the exercise was essential to test collaborative working between the agencies. “We have already worked with Cumbria Fire and Rescue Service on defibrillator training with our staff as we now have this equipment on our sites. This exercise was an extension of this relationship,” he said. Oliver Streatfeild is Contract Plant Specialist with Network Rail in Carlisle. Network Rail worked with Story Contracting in providing the ironwork for the rail test track. He said: “This was an important training exercise which allowed us to reassure ourselves that the emergency services are trained in the correct procedures for such incidents. It is all about partnerships and collaborative working. On the frontline with a team of medical staff was Amanda Singleton, Senior Paramedic with the North West Ambulance Service. Her job was to make sure the casualties were correctly prioritised. She explained: “We have to treat exercises as real-life emergencies if they are to be of value. You have to get into the mindset where you believe you are treating real casualties in a situation which is constantly evolving all the time, while liaising with the fire service. If the warnings activate, stop – unless it’s unsafe to do so.